Home Business Are Interns Filling Africa’s Technology skills gap ? 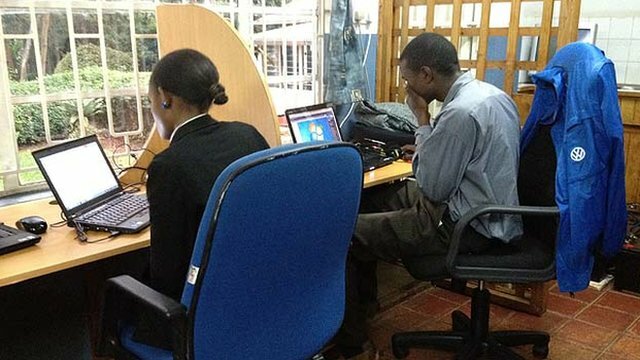 Are Interns Filling Africa’s Technology skills gap ? Are these interns the technology giants of the future? The Kenyan capital is booming, with multinational after multinational moving their African headquarters here.At the heart of this lies the technology industry, growing by 20% annually. The population is one of the most educated in the region, unemployment is running at around 40% – yet technology companies are struggling to hire enough qualified talent. Something that could, if left unchecked, derail Kenya’s technology explosion. In one of Nairobi’s many gated suburbs, tucked away behind a luxuriant hedge, is Computer Revolution Africa. The IT company occupies a sprawling colonial bungalow in the middle of a shady garden. 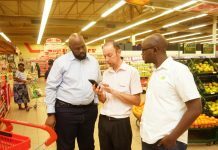 Computer Revolution’s Simon Kinuthia says the internship programme has save him time and moneyFor director Simon Kinuthia recruiting new graduates to join the team has been tough.”I would say it has been a nightmare,” he says. “We do not get the right people from the universities and tertiary institutions where we expect technology-trained students to come from. His company is taking part in a internship project run by an NGO called NetHope and technology giant Microsoft. After a vigorous selection process, 400 computer science graduates are whittled down to 40. The successful group are then trained at the Net Hope Academy – partly funded by a Microsoft grant. Then the interns are placed with companies, about half through Microsoft partners, to gain that all-important practical experience. Lease Mutisya says the internship has helped her decide where her ambitions lie”[The course] was actually very vigorous but it was also very interesting and I got to learn a lot,” says current intern Lease Mutisya. “Actually getting this place is more of a golden opportunity, and it means a lot to me, because it’s like achieving one of my dreams.”The project is more than just a philanthropic gesture according to Microsoft’s Mark Matunga. “Obviously the impact is clear that there will be stagnated growth in the technology sector, technology being an agent of growth in the 21st century,” he says. It’s not only in the technology sector where companies and jobseekers alike have problems finding a good fit. Nancy Wang and her M-Kazi co-founders Lino Carcoforo and Mem Maina. “There’s an incredible pool of working Kenyans who are very highly educated,” she says. Nancy Wang is one of a generation of young entrepreneurs that has migrated to East Africa to make their fortune, arriving here in 2006.After running her own business in South Sudan for five years, she returned to Nairobi looking for opportunities. When a Kenyan friend of hers came to her house to polish up her CV and apply for some jobs she realised she had found a gap in the market. In Kenya, job-hunting can mean a lengthy journey across town by bus to an internet café, the constant expense of paying for newspapers, and most likely relying word of mouth. “Information is so hard to come by, whereas you know the affluent, they get a lot of job information because family members or communities are able to link them to the right opportunities,” she says. “Whereas if you are a fresh graduate living in Kisumu, or even more rural outside of the major cities, it’s very difficult for you to hear about the job information or opportunities. This was the inspiration for recruitment platform M-Kazi. Kazi is Swahili for job. This is more than just a job listings website. Designed for a country where many people have limited access to the internet – but where just over 70% of the population has access to a mobile – it works on the most basic mobile phone handsets. Job seekers register their details from their phones using technology called Unstructured Supplementary Service Data (USSD) – a sort of souped-up text message system that works more like a secure form of chat. One trip to the internet café is still necessary, to upload their CV. But after that users can send a coded text, and it will be sent with a generic covering letter to prospective employers. Sylvia Wamuyu lives in Nairobi. The 24-year-old has been looking for work since the beginning of the year. “It has been tough getting a job since most of the applications you send no one ever replies, even with a regret if you never made it to be shortlisted,” she says. “Other agencies take your money with the hopes of getting you a job but only to find that they were fraudsters.” She started using M-Kazi several weeks ago and since then has landed a job as a receptionist with printing and marketing company Identity Partners. Her new employer is Monicah Ngongoo. As a small business employing four people, finding reliable staff has been difficult, especially as she relied on referrals from family and friends. “This has been the biggest issue for me when I started my business, as I ended up with inexperienced personnel,” she says. “The best thing about M-Kazi is that I didn’t have to go through irrelevant CVs, as the ones I received were filtered to the category I wanted, it was so easy as I had to call only four people for an interview. The service is fairly new, so for now it is free for employers to post jobs, while the young company builds up a comprehensive database. Employees are charged a nominal amount for text messages containing vacancies. Current estimates put the population of Nairobi at around 3m – and it’s growing fast. Getting the right people into the right jobs – and finding ways to harness technology to make that happen may ultimately ensure that this expansion in population is mirrored by one in the economy, rather than in unemployment levels.